Rachael Shawyer (Morland) is a 4 star Senior Instructor based in Derbyshire. She teaches regular courses, workshops and camps at her yard in Derbyshire as well as teaching groups all around the UK. For more information on Rachael and the courses and workshops she teaches please visit www.rachaelmorland.co.uk or call 07917 443 288. 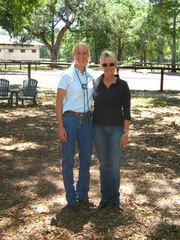 My journey to becoming a Parelli Professional. I bought my first horse when I was 20 and chose what I thought was the horse of my dreams.... Looking back he was completely unsuitable as a first horse. 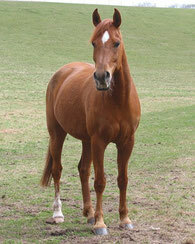 He was a young, pretty much unstarted Arab gelding who was terrified of everything. To me he was perfect! I thought he was beautiful and I loved his wildness. In my mind I had decided that it would be easy to tame him and have him become my partner just like the horses I'd seen in the movies. With a bit of love and time I thought he'd soon be following me everywhere and thought we'd be able to go anywhere together. Well.... that dream lasted all of about 5 minutes as I started to realise I had my hands full! I have very clear memories of him spooking and being terrified of everything, I couldn't tie him, he was difficult to trim, vet and for the dentist, he wouldn't stand still for saddling or mounting (my friend would hold him as I ran in a circle around her trying to girth the saddle etc) and when we did ride out he would jog everywhere and be up everyone's drive whenever a car came by, (he once jumped a 3 foot garden wall onto someone's lawn because of a lorry passing). I spent about a year schooling him using all the usual techniques and we did make some progress but he was still very spooky and panicky about lots of things and when I rode he would want to bolt at any opportunity. Any time I released the reins even a little he'd take off. Then...... luckily.... my Aunt and Uncle bought me tickets to see Pat and Linda Parelli at a two day teaching conference. 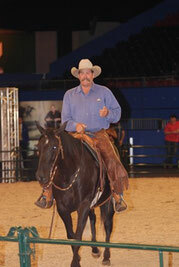 I had heard of natural horsemanship before and tried a few things I'd read about but I had never seen Parelli before. My life changed that weekend! I literally sat mesmerised for the whole two days. This was exactly what I’d been looking for and dreaming of and I never knew it existed. I watched Pat play with a challenging horse that acted quite similarly to Phoenix. 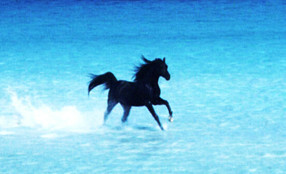 In a very short time the horse became calm, trusting and happy to do as he asked both on the ground and ridden. Watching Pat work and listening to him explain why horses behave the way they do, I was able to see how to go about achieving exactly the same results with my horse. 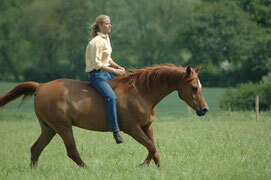 There was also an Instructor team at this event and I watched them ride around with no saddles or bridles. They cantered, jumped and could turn and stop with no reins and then, when they got off, their horses followed them around. I remember watching amazed and then thinking "if they can learn this, then so can I" and I made the descision to study the program and train to be a instructor. I started working through the levels program from that conference in Oct 2002 and things between me and my horse changed dramatically. He became confident, responsive rather than reactive, calm and really started to feel like a partner. As we progressed, things that I never would have believed possible started to become easy and about 2 years after starting the program, I was able to live my dream of galloping along the beach with no bridle or saddle and still be in complete control. This was something I had never believed possible with any horse let alone my crazy Arab. I passed level 3 of the program in April 2006 and over the next year spent around 6 months at the US Parelli Centres taking part in various University modules including two 3 week colt starts with Pat Parelli and Rob McAuliffe and received 2 stars in instructing and 2 stars in colt starting. In 2007/08 I spent a year working as part of the Instructor team at the UK Parelli Centre and was lucky to get to work closely with Neil Pye, Susan Shoemark and Rob McAuliffe during that time. I received my 3 star Instructor rating in April 2009 and then in 2010 returned to Florida again as a student of Pat's mastery program, spending time with both Pat and Linda, as well as many other high level instructors. 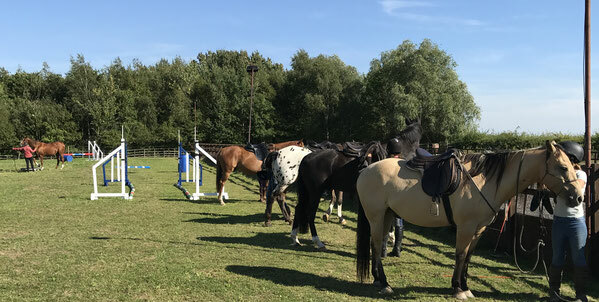 In 2015 I received my 4 star Instructor rating and I now teach regular Parelli Courses and Workshops across the country and continue to return to the UK and US Centres both to teach courses and to participate in courses and instructor training days with Linda and Pat Parelli.